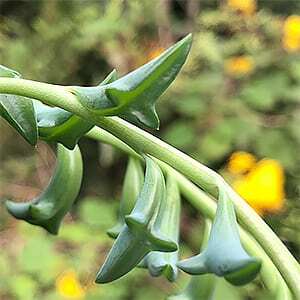 With leaves that look like leaping dolphins, Senecio Peregrinus is commonly called the Dolphin Necklace. This amazing little succulent is all the rage in Japan and is now becoming more widely available. It is best suited to growing in a hanging basket, it is a hybrid between two other Senecio species and it will naturally develop a trailing habit. One of the joys of this plant is that it is easy to grow. Given a well drained soil and position in good filtered light it thrives. Like most Senecio species it is more tolerant of a range of growing mediums than some other succulents. Watering is easy, usually one deep watering every week or two over summer is enough if you are growing the plant under cover. You can check the soil to see if its dry, if it is its time to water, if its moist, do not water. During winter the plant will go into dormancy and less water will be required. Fertiliser can be kept to a minimum, one application each year will be enough. Over time the stems of the plant will trail down and may need pruning. In fact you plants are best lightly tip pruned to help develop a more bushy growth habit.